There's nothing more forlorn than a limp stick of celery, abandoned and forgotten in the bottom of a salad drawer. 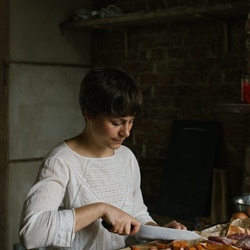 In the first of a new series on unglamorous vegetables, Anna Tobias presents a few of her favourite ways to make the most of this unsung hero of the kitchen. I’m saddened that celery is considered an unglamorous vegetable. Often sidelined as a filler veg or simply something that forms part of a base for a recipe, celery is not being used and appreciated to its full potential. Whilst it does, of course, contribute enormously to forming a first layer or flavour in many dishes, it is also capable of so much more and is an ingredient that deserves to be the star of the show, not just a supporting act. That said, I can understand why celery has fallen from grace. Most of the time celery is bought in sad plastic wrappers or pre-sliced into dry batons ready for dipping and barely tastes of anything at all. This is why I would advocate seeking out what is known as ‘leafy celery’, or Fenland Celery PGI when it is in season (which runs from mid-October to the end of December). The latter is a very traditional, heritage variety of celery that grows exclusively in the marsh Fenlands of eastern England. They are grown in a gentle way, allowing the flavour to stay sweeter and the texture more tender. The flavour difference between these celeries and intensively grown ones is remarkable – they’re like two different vegetables. 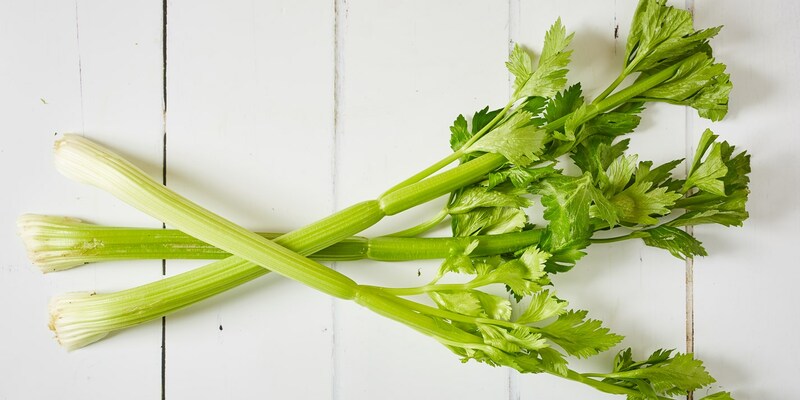 Leafy and Fenland celery are incredibly aromatic and green tasting with the outer stems slightly bitter and punchy, moving into the moreish sweet stems in the middle. 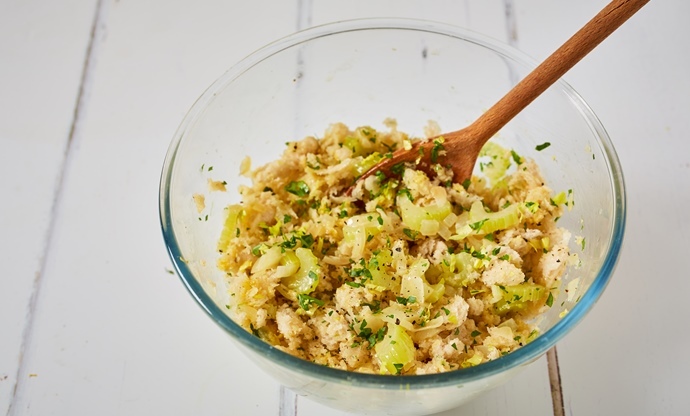 Here are three recipes which showcase celery at its full potential. 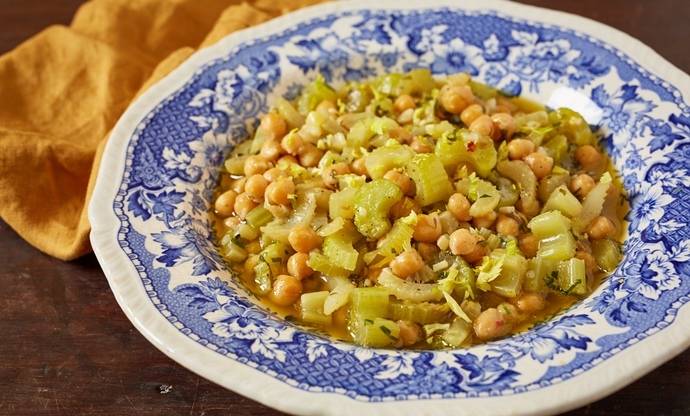 This recipe highlights the wonderful earthy sweetness of celery. It’s a twist on a classically Italian way of serving pulses, where the pulse is tossed into sizzling parsley and garlic and served just so. The addition of celery adds depth of flavour and aroma. Whilst some forethought is required in soaking the chickpeas, the actual cooking is very simple indeed. This dish is delicious eaten on its own as a light meal, but can be made more substantial as a lunch dish with the addition of a soft-boiled egg. Alternatively, it is a fantastic side dish to any grilled meat, especially pork and chicken. This is a recipe where the three core ingredients really stand out on their own and sit harmoniously next to one another. 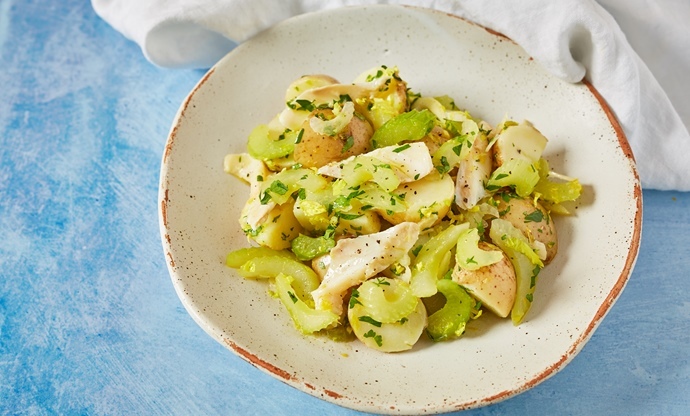 Salty cod; soothing, gentle potato and aromatic, crunchy celery. This is either a delicious starter or else perfect for a light lunch. Any leftovers can be fried up to make a wonderful hash with a fried egg.